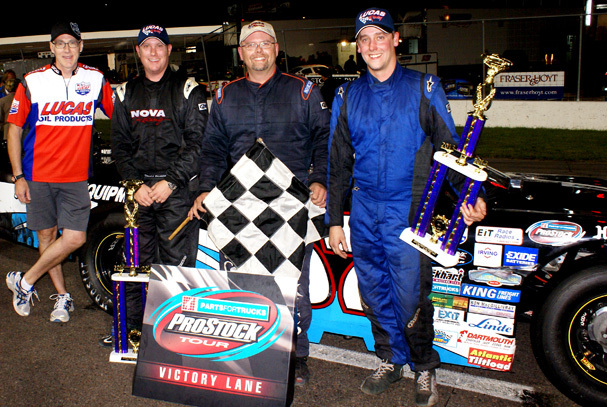 JAMES RIVER, NS (September 7, 2013) – Shawn Tucker (Fredericton, NB) took his second consecutive and fourth Parts for Trucks Pro Stock Tour victory of the 2013 season Saturday night in the Lucas Oil 100 at Riverside International Speedway. The event came down to a green-white-checkered finish where Tucker had to hold off hometown favorite Donald Chisholm (Antigonish) and Darren MacKinnon (Charlottetown, PE) for the victory. Second and third finished neck-and-neck with a mere 0.018 second split as they crossed the finish line. Exide Batteries Rookie of the Year contender Dylan Blenkhorn (Truro) was fourth and sophomore Brad Eddy (Lower Sackville) finished fifth in the #13 King Competition Ford. Tucker started on the pole for the feature after winning the King Freight Lines Dash for Cash. Current point leader John Flemming (Halifax) took home Atlantic Tiltload Time Trials with a blistering 14.333 second lap. Runner-up Donald Chisholm won the Linde Most Laps Lead Award. Dylan Blenkhorn (Truro, NS) picked up the Absolute Traffic Services Hard Charger and the Exide Batteries Rookie of the Race awards. Darren MacKinnon and George Koszkulics (New Glasgow, NS) both picked up wins in their respective Dartmouth Dodge Heat Races. With one race to go, Tucker will enter the season finale at Scotia Speedworld next Saturday 49 points behind Flemming, who finished a lap down in 11th at Riverside. When it comes to the Exide Batteries Rookie of the Year Award, sixth place finisher in the Lucas Oil 100 Cole Butcher (Porter’s Lake) sits 44 points behind Blenkhorn heading into the Dartmouth Dodge 200. Next Saturday’s Dartmouth Dodge 200 will decide who takes home the prestigious championship and the $10,000 cheque. Don’t miss the Dartmouth Dodge 200 next Saturday, September 14 at 4:00 p.m. Advance tickets are on sale now at all Ticket Atlantic locations and will also be available at the gate on race day (cash only). For complete event information and ticket prices please visit www.scotiaspeedworld.ca or www.maritimeprostocktour.com. The Lucas Oil 100 concludes the 2013 season at Riverside International Raceway. Riverside International Speedway is recognized as a premiere stock racing facility in Canada. The 1/3-mile high banked asphalt oval roars to action several times a year for special events. It is the home for eastern Canada’s only NASCAR event, and of the IWK 250 – widely known as the best stock car race in Canada. Located in James River, between New Glasgow and Antigonish, the facility is easily accessible at exit 30 on Trans-Canada Highway 104. For more information call 902.863.2410 or click www.riversidespeedway.ca. The Parts for Trucks Pro Stock Tour visits five tracks throughout the Maritimes during its May through September season. The Parts for Trucks Pro Stock Tour is owned and operated by Maritime Pro Stock Tour Limited. For more information, call our administration office at 902.481.2531 or click www.maritimeprostocktour.com. You can also follow us on Twitter at www.twitter.com/prostocktour and like us on Facebook at www.facebook.com/prostocktour.